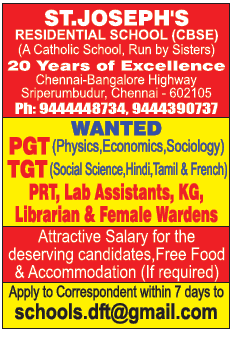 St.Joseph's Residential School, Chennai has advertised in The Hindu newspaper for the recruitment of PGT plus TGT jobs vacancies. Interested and eligible job aspirants are requested to apply with in 7 days. Check out further more details below. About School: St.Joseph's Residential School- is a Co - Educational English Medium School, Affiliated to Central Board of Secondary Education situated at Chennai - Bangalore National Highway, Sriperumbudur. The School was founded by Rev. Fr. Dr. J.E.Arul Raj, and is run by the Society of DMI (Daughters of Mary Immaculate).It is full pledged school with classes from Std I to Std XII. The School shows the remarkable Commitment to groom the Child to be mentally, emotionally and physically fit. It aims to provide quality education to excel in his / her chosen field and face global challenges.